In my project I have problems with the cranes. Can someone help me with an idea about crane simulation. I suppose if there are resource production records you will still get it right as no re-schedule is to be performed, all we want is to take a granular look at current assignments. The added value of this report versus a free [idle] time report is that it gives you information about the activities using the resource. 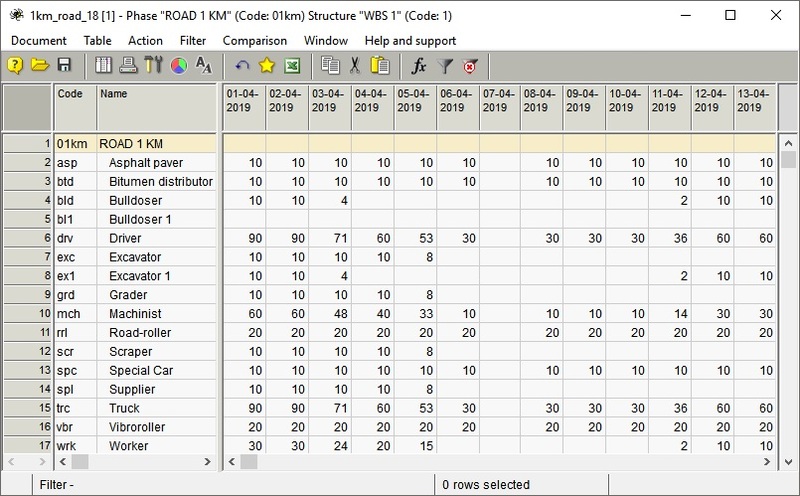 When the availability is fixed [that is when resource production does not change availability] then by temporarily setting availability to 0 and running the overloads report we can get the desired granular report in a table. Do not resource level this temp version as to keep resource leveling prior to adjusting availability to 0. If you need more granularity it can go down to the second by adjusting column format [LOL]. I am looking for granularity, for report to be easy to communicate and concise. Overloads report is granular to the minute/seconds, comprehensive - all resources shown, no need to horizontal scroll, no missing periods data, easy to create (at a single click of the mouse), easy to communicate all necessary data within single report. I love the way this report is organized, just print and send to others. 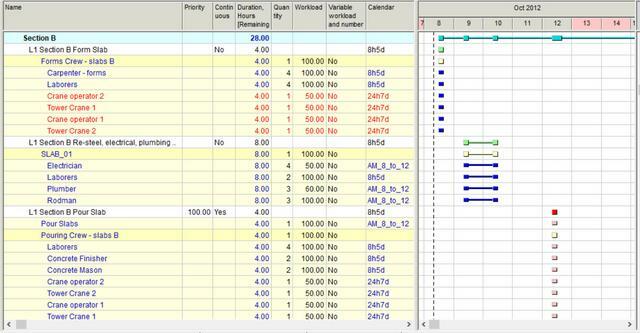 I do not expect such granularity from available diagram/table reports, would be impractical. Diagram is not granular enough, it is difficult to communicate to those without access to the software, it is difficult to scroll hundred days at this scale. 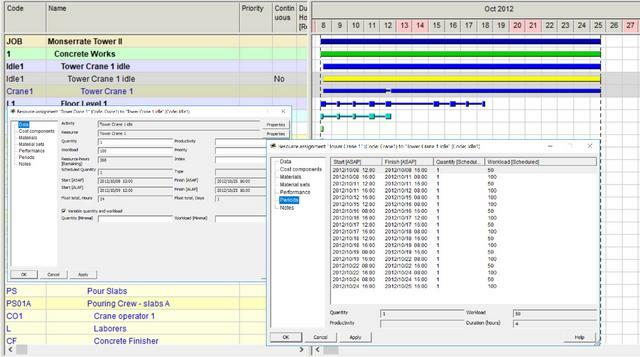 While resource leveling gets it right to the minutes the diagram cannot disclose correct values within the hour 8:00-9:00. Please take a look at the following figure diagrams, details are missing even when activities have full hours durations but start or finish minutes outside star/finish of the hour. 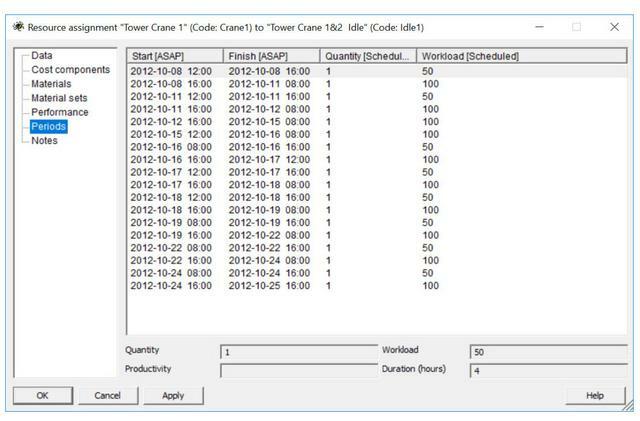 Anyway the software calculates correct dates to the minutes/seconds, same happens with the overloads report. Spider Project creates reports on resource idle quantities and hours. If it is necessary to get such reports on specific resources they shall be named in project model (not Cranes but Crane1 and Crane2). 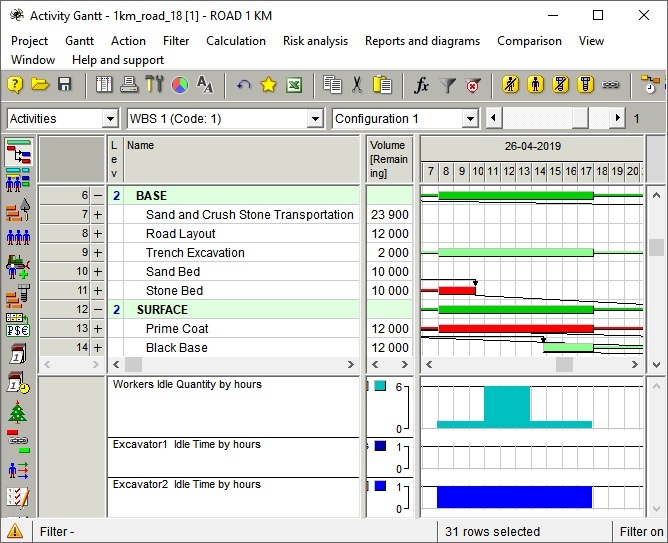 In the diagram below you may see idle workers by hours, idle times of two different excavators used in the same project by hours (one is busy, second is free). I believe the hammock method can be confusing when creating free-time reports as idle resources are assigned to a hammock. In some jobs you might only be interested in a few resources idle time but in others it might be all resources idle time is of interest. Knowing available effort hours is not good enough, resource quantity and workloads matter. If I have 2 cranes assigned 50% of their time during some window of time I have the spare resources for 2 cranes assigned 50% or less but not for 1 crane assigned 100%. Some tasks can do it with 2 cranes but as you said before if the crane shall hold something it means that the crane is required 100%. How can I export Periods Table from resource assignment properties into Excel? I am looking for something similar to the Resources-overload report but for Resource-availability. 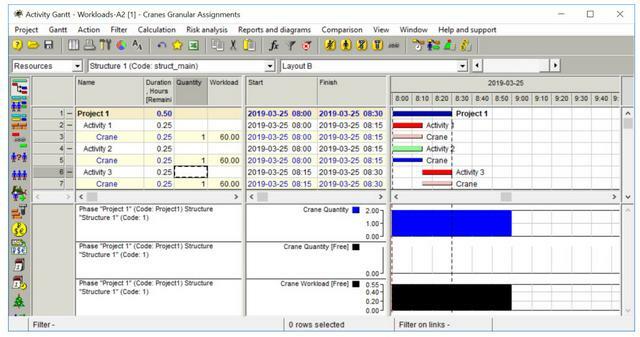 The idea is to be able to schedule some usage of the Tower Cranes within available windows without creating new activities for such single occurrence events; hopefully to find windows of availability during or close to daylight hours. The required windows might be of short duration, say 20 minutes. The resource overloads report already provides the granularity I am looking. I tried with tabular reports but might be missing something. Yes Rafael, it makes sense to add the requirement for continuous exection as the reason of delay. 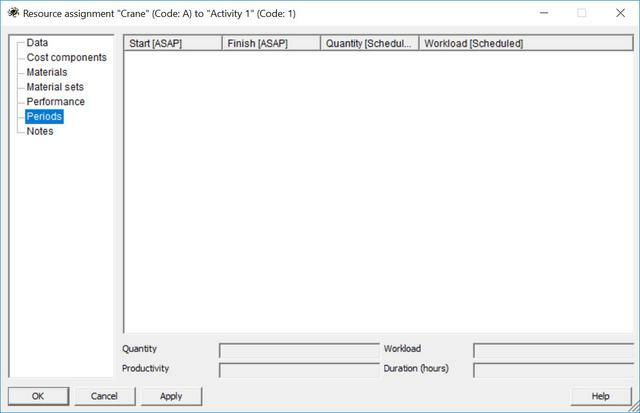 Spider Proect provides reports on resources idle time. Do you mean something else? Missing Reason of Delay - when activity execution is delayed by the requirement/constraint that work be scheduled within same day [continuous]? 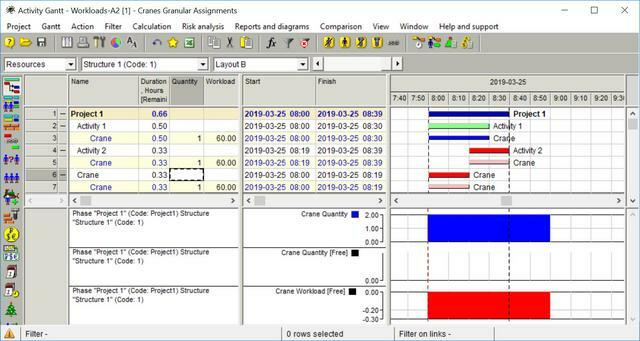 Resource idle time Report – a frequent question by suppliers and subcontractors regarding not-planned availability of the cranes. Date and specific time is required. What is your suggestion? 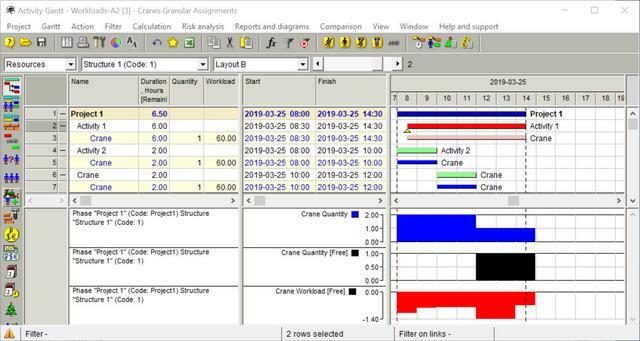 In addition to partial workloads when scheduling crane usage, calendars as well as other activity attributes such as the requirement for work to be scheduled to be executed during same day [continuous] should be considered. Section A work is performed using Tower Crane 1. Section B work is performed by a crew sharing Tower Cranes 1 & 2. As some areas are accessible only by one of the cranes both cranes shall be assigned; to same task same crew, crane 1&2 and operator 1&2 at 50% as only one can be working at Section B at any given time while the work shall be contiguous. Section C work is performed using Tower Crane 2. Concrete Pour Activities scheduled to happen within same day [continuous]. It is not uncommon to assign crane to same activity as a separate team working few specific hours of the day, to split the activity is not a good idea as resource leveling might schedule the work to be non-contiguous when what you need is for always such work be scheduled contiguous. Usually it is better if you use the reasoning people on the field have successfully used for many years. Many times the reasoning is complex and requires complex models; do not underestimate people on the field. Shortcuts to simplify the schedule is dangerous, overloads might be masked if using averages. Crane belongs to all crews with partial assignment. Estimate the percentage of work time crane is required by different crews. We do it estimaring the overall number of liftings the crane can do during the shift (and the time for one lift) and the number of lifting required by certain job during its duration. Ar some jobs the crane shall hold something and it means that the crane is 100% assigned. If the crane is properly assigned resource (crane) leveling defines the order of work.